Continuing on our beery journey through December... We've tried to select beers that represent a good selection of our favourite breweries (those that bottle, at least), covering a range of styles, with many also having a little story behind them too. We selected this beer as 2015 has truly been the year of Craft Beer Hour! We've followed this from the beginning and were able to properly get involved with a greatly enjoyable trip to the Intrepid brewery, followed by tea at the fantastic community owned Anglers Rest in Bamford. This beer is pleasantly smooth, with wafts of a delectable hop character that brings a delicate floral nature to the malty mouthfeel, whilst being altogether an easy drinker. A classic porter brought to the more modern palate. Fickle reason for picking this initially - Laura cannot resist any beer with an owl included in the artwork. Having tried this on keg a few months ago, we were blown away by the powerfully fruity, refreshing nature of this American-style pale ale, produced by a Munich-based brewery. The bottled version has less hop pizazz, but is still a very tasty drink... Resinous and lightly floral in aroma. Grapefruity and bitter on the palate, with an almost savoury, herbal edge and a dry finish. As soon as this hits the glass, you know you've got a BIG drink. Massively rich and creamy on the nose, with molasses and hints of tannins. On the palate it's thick, almost to the point of being syrupy, with full bodied flavours of black treacle and hot buttered toast. The finish is deeply roasted, with an almost burnt nature that lingers behind. We've been ageing this for about two years - definitely worth the wait. Aged in Ardbeg barrels, this appealed to the whisky fans in us as much as the beer lover! There's a hint of sweet wood smoke from the cask but this doesn't overwhelm at all... in fact we'd have liked a little more! None the less this is a beautiful beer that feels luxurious in drinking - oily, rich and leaves a gentle peaty sweetness on the tongue. We'd been having a great day so far and upon arrival at Bundobust it was clear our anniversary celebrations had only just begun. 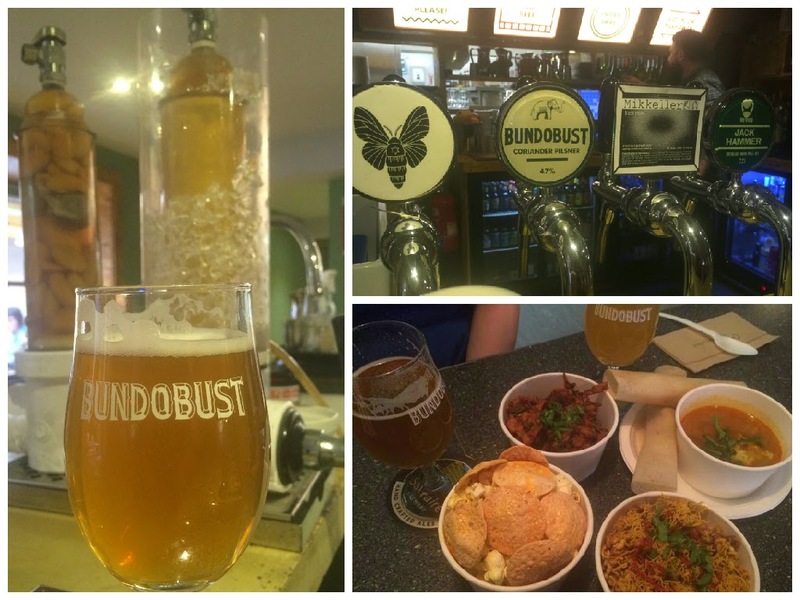 If you've not been to Bundobust yet, it's an absolute must-visit. A tiny shop front opens up into a spacious and welcoming canteen-style eatery which has a bit of a street market feel about it, the bare brick and chipboard clad walls bringing the outside in. The bar is located towards the back of the room - and what a bar. 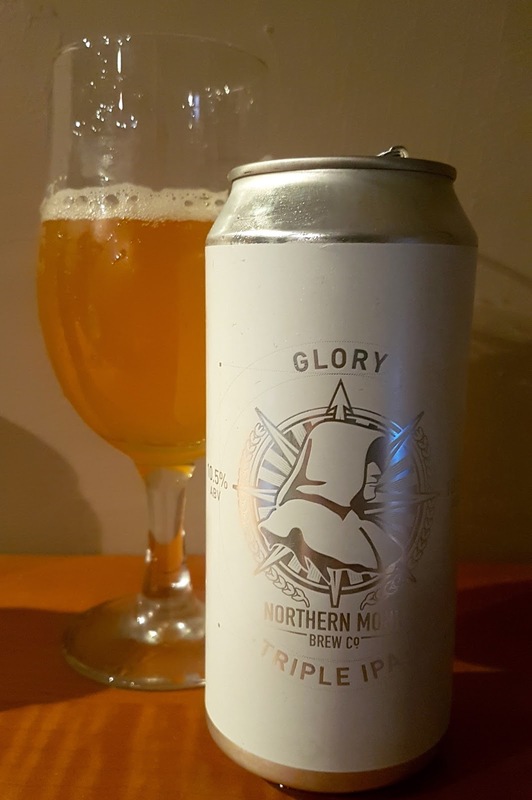 We started with a Northern Monk and Bad Seed collaboration, Salted Lime Wit, which was fragrant with rosewater, plenty of fruitiness and a salty tang to finish, and the tantalisingly fresh and vibrant Wiper and True saison. We'd heard only good things about the food here, and couldn't wait to dive in. The menu is entirely vegetarian but even us hardened carnivores were enticed by every item. We eventually selected four little pots - the "Popcorn and Pops", chilli popcorn with miniature poppadoms in four different flavours, Onion Gobi Bhaji Bhaji, Massala Dosa (which were accompanied by a wonderfully fragrant curried lentil soup with coconut), and our favourite of the four, Bhel Puri - sort of like a bombay mix salad. Both of the beers we'd already chosen were absolutely perfect matches for the delicately spiced munch, as were our next selections - Bundobust's own Coriander Pilsner, which was crisp and refreshing, and a version of the Wiper and True saison, which had been filtered in-house through rosemary and fresh apricots which added a unique and delicious new dimension to the beer. It's also worth mentioning here that the staff at Bundobust were ace - friendly, knowledgeable, and happy to share recommendations for food and beer alike. 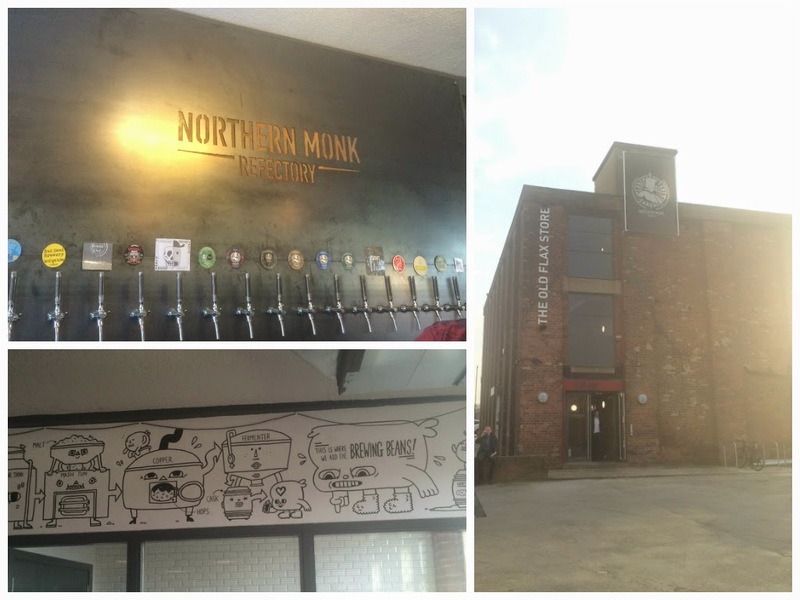 Moving on, it was time for yet another new place for us - the Northern Monk Refectory. A striking building against the otherwise stark Holbeck skyline, it is also home to the Northern Monk brewery itself. A modern, industrial feel is prominent in the bar, with 20 beers on offer - a wide range of both Northern Monk and guest. Jim started with the wonderful Faith made on the floor below. The beer itself is a US pale with bold rose and resin flavours, made with citra and then more citra. The first round also brought us Bad Seed Barrel Aged Saison, a tangy, tasty treat. We followed up with a trio of beers; two from the host brewery and an offering from Swedish brew masterminds Mikkeller. The first was Northern Monk's 6.2% New World IPA, made with a variety of hops from around the world. From the glass emanated an enchantingly tropical aroma, with a bold body from the volume of hops added in the boil. The other two were at the opposite end of the spectrum in terms of colour, both being jet black - Peated Soul from Northern Monk and Monk's Brew from Mikkeller. The bold smoke that drifted from the Peated Soul certainly appealed to our Islay whisky tastes, the warmth from the malt rich and a little unforgiving, but at the same time with dark chocolate and a warm sweetness - the roundness of the drink was glorious. The Mikkeller on the other hand was clean with a little hop bitterness, complemented by a vanilla sweetness and some dark fruits including cherries, accompanied with a slight coffee. The body itself was light and in no way tasted of the 10% ABV. Final stop before the train home was a trip to Tapped. We couldn't resist a bit more of a nibble before the journey and had heard many good things about Big Dan's Pizza. We decided to share 'The Smokey One' topped with a lightly smoked chicken breast, grilled onions, and a deliciously sticky balsamic reduction. To accompany we had a glass of the balsamic hued Stone - Sublimely Self Righteous Ale, which was exactly what a Black IPA should be, light roasted malt flavours with a bold hoppy sensation across its nose and mouth. We returned back to Sheffield happy and ever so slightly wobbly, with plans of a return visit already in the pipeline. Leeds has massively upped its beery game in the last couple of years and we are certainly willing participants.